As you can see, they have suffered a bit of damage with the prints being stored face to face at some point in the last 20 years resulting in them sticking together. This first one on the left took the brunt of the damage. It’s dated the 4th November 1993 with the other being from the 30th of the same month. 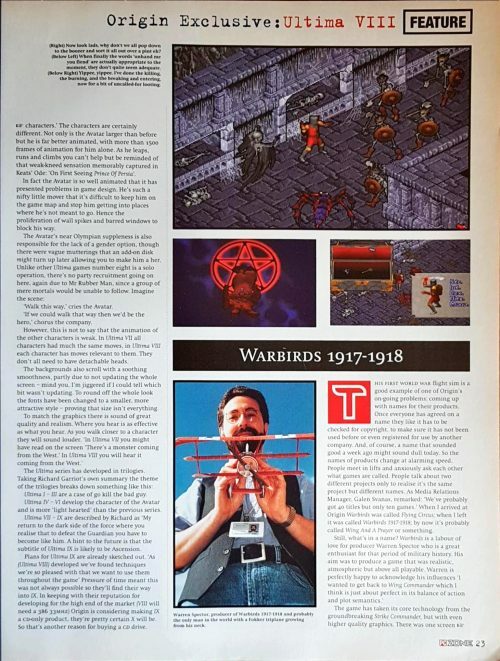 Aside from swapping out some screenshots the sales pitch was reworded and reorganised in that month with the latter being a clear improvement in my opinion. I thought it was particularly odd that the earlier advert lists compatibility with EMS and XMS memory in its short list of selling points as this wouldn’t have been high on my list of reasons to buy a game. Playing with DOS config files was par for the course for PC gamers back then the way I remember it. 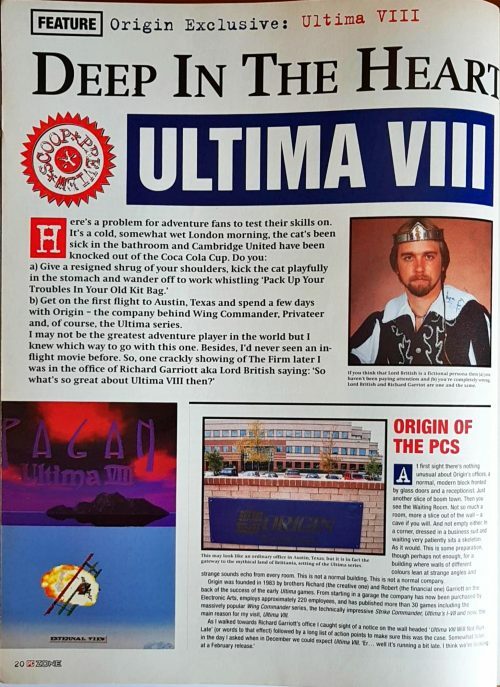 I’m sure this has to be a nod to the difficulties people had with the Voodoo memory manager Origin had used for Ultima 7 which was especially particular and continued to make the game tricky to run for years afterward. 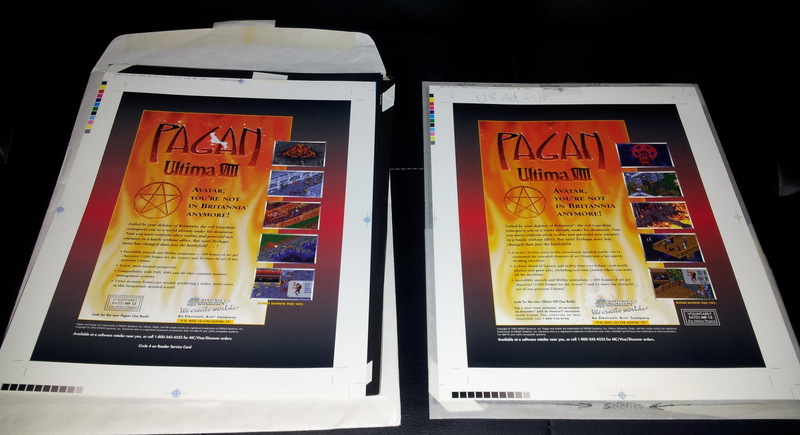 All being well the next post on here should be the final stages of Ultima 5 on the NES. 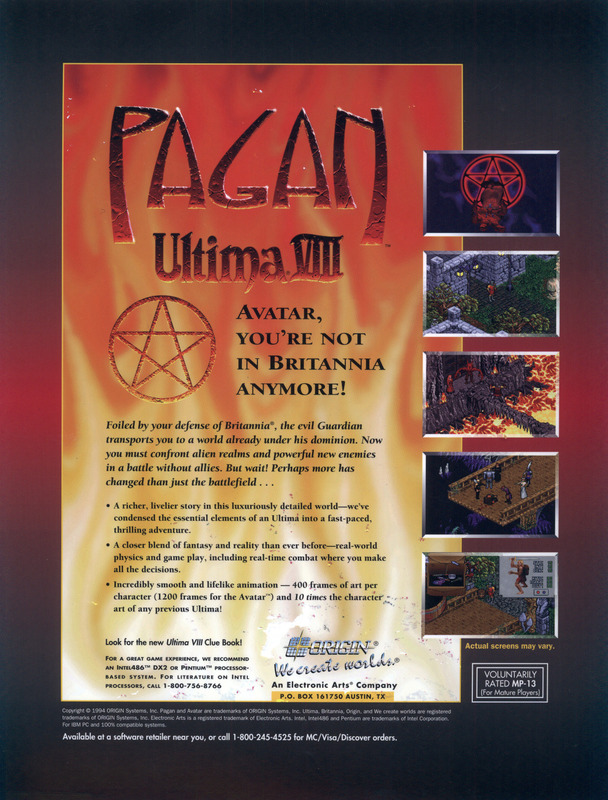 I got a new graphics card last week which is why it has been dead around here recently with any time I’ve spent gaming being on relatively modern titles but I’ve decided that I’m not going to be beaten by Ultima 5 and will start a new playthrough as soon as I’m done with Max Payne 3. I’ll be using an emulator this time with the plan being to speed back to where I was as quickly as possible. My time in Austin is up and I’m heading back for England and real life. This has been one crazy week especially Thursday when we got a Portalarium tour + questions with Richard Garriott, then went out later for margaritas and dinner with Chris Roberts. This isn’t the sort of schedule I’m used to. 1. You need to have a flexible itinerary to work for a game company that is running a funding campaign. 2. Hardly anyone out here knew about this site except for Chris Roberts who uses it to check out things about his own games. I guess I can settle for that. 3. Texans apparently shop for guns like other people shop for grocery. 4. 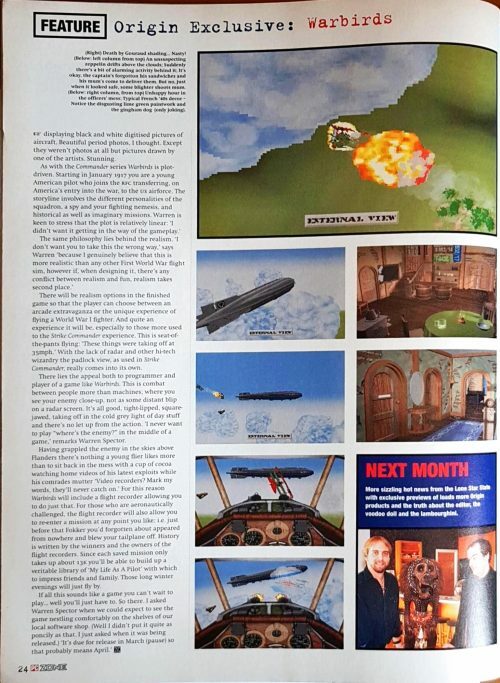 The long missing Wing Commander 2 for SNES probably exists in Richard Garriott’s archives but it could be a year before he has time to look for it. He isn’t at all confident about having The Lost Vale though which he didn’t think ever got finished. 5. The margaritas on sixth street are a whole lot better than the food. 6. 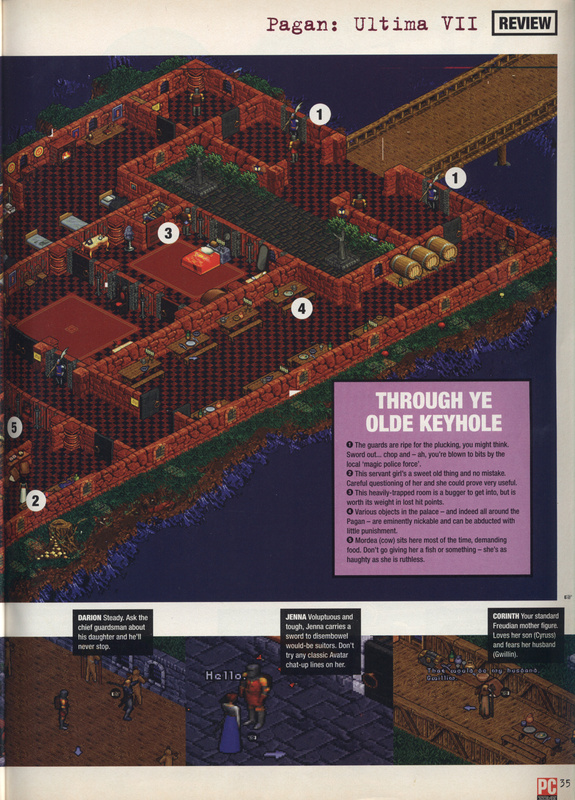 Contrary to what I had heard, Garriott was well aware of Escape From Mt. 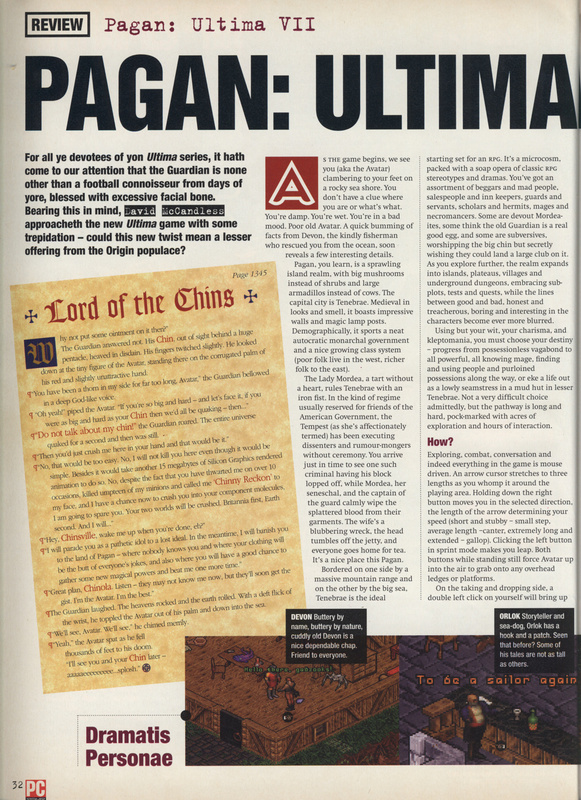 Drash and agreed to the Ultima branding to help out the author as Sierra wouldn’t have published the game otherwise. The downside here is this makes it official enough for me to want a copy now. 7. The WC CIC team put a whole more effort into their site than I do mine. 8. Space Rogue wasn’t in fact the inspiration for Wing Commander but Chris Roberts did get some advice on 3D programming from Paul Neurath. 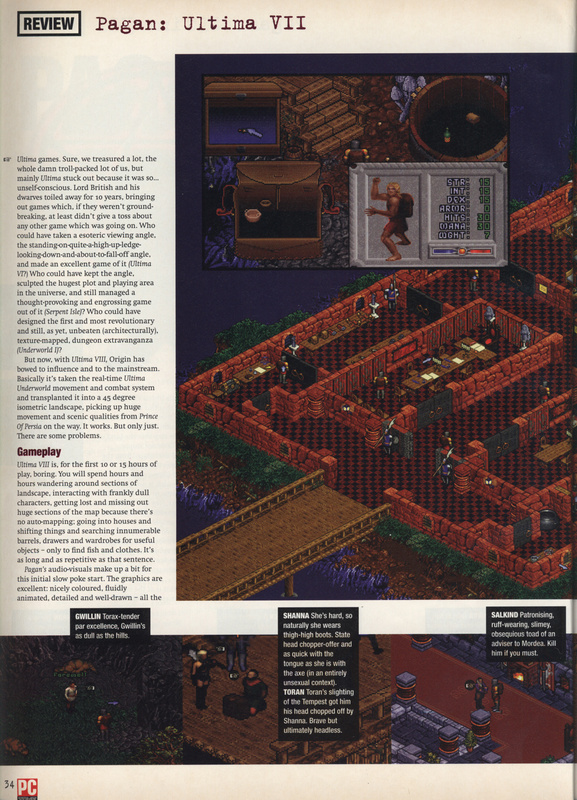 Roberts already had a 2D sprite based prototype running prior to this and it definitely wasn’t a fantasy game. 9. 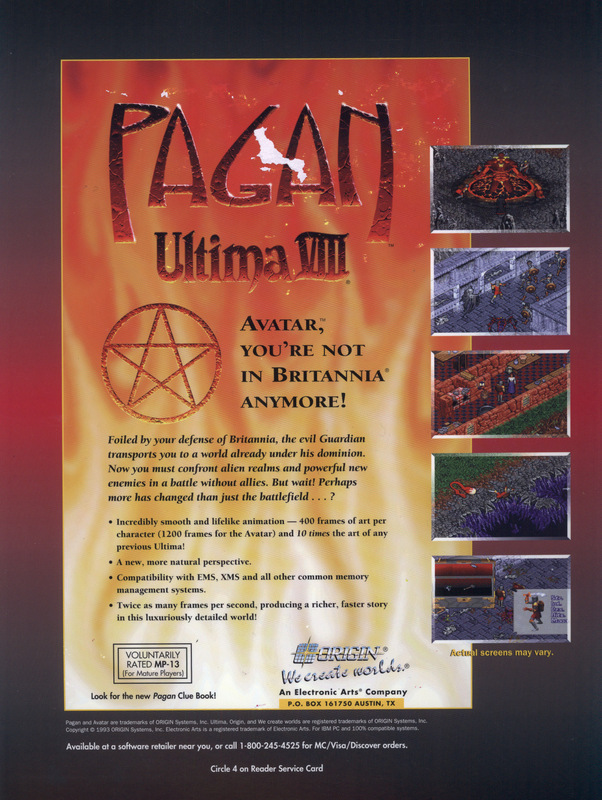 The Ultima anime series is a myth and never existed. Huge thanks to all the crew from the WC CIC for letting me tag along all this week. 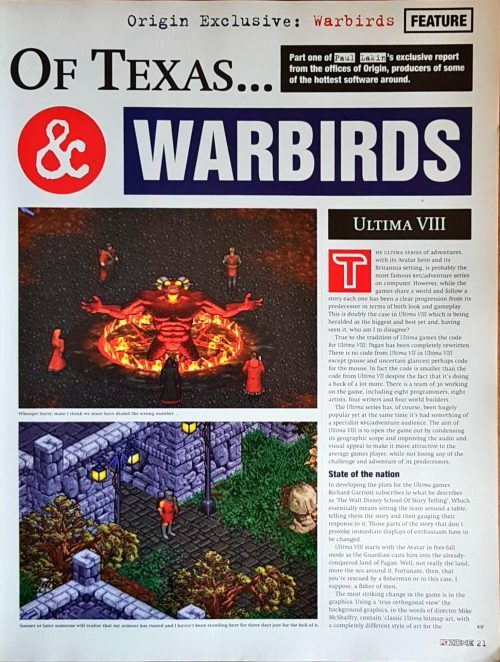 This is a review of Ultima 8 from the June 1994 PC Zone. 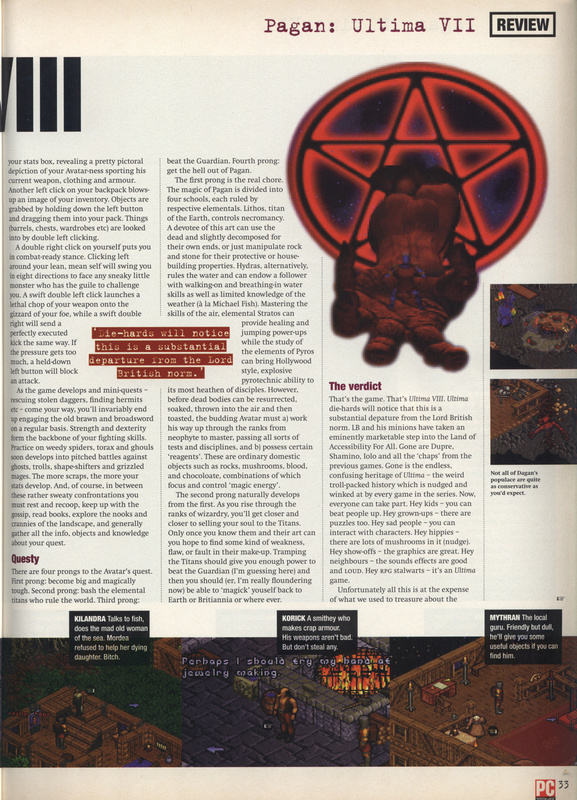 The reviewer describes it as a love/hate sort of game which I can agree with falling more into the hate camp myself. He was clearly reviewing the first unpatched version and was suffering with the platform jumping. I should have had more updates over the weekend but I’ve spent a crazy amount of time getting my Win 98/DOS machine up and running. I’ve got it dual booting into DOS 6.0 now, and have my AWE32 and SBLive coexisting inside Windows. I’ve also managed to get it wired up to my MT-32 and SC-155 via the AWE32. This isn’t ideal as it requires a TSR to process the MIDI in DOS but it works in most games. My USB keyboard causes glitches in DOS resulting in slowdown, or hanging/crashing. I’ve now given in on that and have just got a second keyboard which I swap to as needed. I found an ancient serial ball-mouse which seems to work ok – first time I’ve used one of those in a very long time. I ought to get something a little better in the long run though. When I use it in Windows I keep finding myself scrolling a non-existent mouse wheel. I’ve still got some problems in DOS. EMM386 refuses to load no matter what. I’ve tried excluding the entire possible memory range and still no luck. I’ve got QEMM 7.5 running but that is struggling as well as if I load QEMM itself into high memory it locks up. Any advice on that is welcome. I’m thinking that a newer version might be enough. With the tiny cd and mouse drivers I’ve still got plenty of free memory so I’m probably ok for all games except those few that insist on EMM386 anyway. The only other problem I noticed is that I don’t appear to be able to redirect the MIDI of DOS games in Win 98 to the MIDI-out and I’m stuck with playing them through the AWE32. Not sure if I’d ever run into an occasion where this would be a big issue but it does rule out running some DOS games inside Win98 if I can’t fix it. I expect a poke around the registry might be needed. Other than that it appears to be working well but I’ve only quickly tried a few games. Highlights so far are playing the first level of Dark Forces and a quick blast on the 3dfx version of Carmageddon.